It was Saturday morning at 5:55 am. 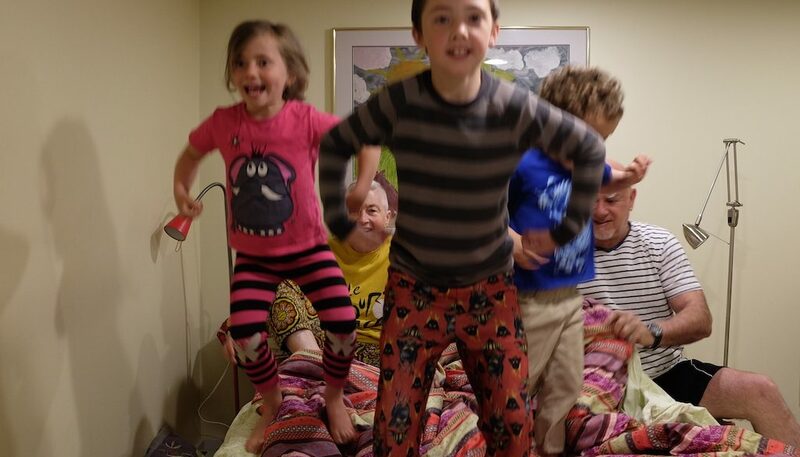 Next to my and Peter’s bed—silhouetted against the bathroom light that we left on so they could see where they were going if they had to pee during the night—stood our three grandchildren: in the middle, curly-top Dante, at 3 the youngest. Holding his hand on each side, his cousins: Kanye the Curious (almost 9) and Aliya the Future Olympian (6). This was their second appearance that morning. Mistaking the motion-sensitive outside light triggered by the breeze for daybreak, one of them—who shall remain nameless—woke up the others and they dashed to our room. That was at 5:25 am. We sternly told them to get back in bed and sleep some more. They were quiet (we are both a bit deaf) for half-an-hour. When they materialized the second time, we accepted the reality that there would be no more sleep this morning for anyone. “Jump in,” we said. Ouma and Oupa “jumped” around too, albeit while half lying down in our roles as bedrails on either side. When we got to “One fell off and bumped his head,” Ouma was the first to hit the floor, aiming for the extra pillow that I toss out every night when I turn on my side to sleep. The next little monkey did not wait for the cue from the song: Dante rolled off on top of me. The big cousins continued jumping and singing, evil connivers that they are. When the cue came, they collaborated in pushing Oupa to the floor. By then it seemed that good manners required those of us on the floor to keep singing so that Kanye and Aliya, too, could have their turn. I have never been good at this kind of silly, physical play. With my own kids, I used to be afraid that someone would get seriously hurt. Not just a bump or a scratch, but an injury involving stitches or x-rays. We did have some of those. With my grandkids, though, my fear has gained another component: I don’t want to be the one calling their parents to meet us at the emergency room. However, I am also good at recognizing a special moment when one roils around me, in this case all the more precious because of the absurdity of the hour. Peter quickly set up his camera. When he got back into bed, we were still going strong—this rumpus was not a one-off affair. “Again, again,” was the mantra of this daybreak. So monkeys we remained until the littlest monkey indeed bumped his head. No blood or bruises, no phone calls required. We trouped upstairs and ate strawberries. There we were, an Oupa and Ouma making memories, complete with photographic evidence: the two of us bouncily bonding with the latest manifestations of our genes. This is the stuff TV commercials are made of: arthritic and short-of-breath Baby Boomers swallow a pill and romp with their grandchildren. For extra pathos, throw in a grandma with dementia. Maybe the jumping monkeys photo will one day bring me—and whoever is showing me the photo—a moment of pleasure. But that, I can assure you, is not the point of this special moment. What matters here is the laughter, the squeals, warm bodies touching, my heart overflowing. The paradox of our age is that while “memory” has become a commodity that is traded on the stock market, our culture’s grasp on it is ever more tenuous: who remembers what they posted last week on Instagram, or FaceBook, or their blog? Or all the things they “liked” per social media protocols? The more frantically we try to capture the moment, it appears, the more quickly it pulls from our grasp. Our culture, in other words, is plagued by short-term memory loss even as the tools for capturing each moment proliferate exponentially. And without short-term memory, you cannot make long-term memory. An event does not become a memory for the ages unless it is invested with deep emotion. Emotion, for many people today, has become the clicking on an emoticon dozens of times a day. Who among us actually summons deep emotion every time he or she instagrams a picture, or tweets a triumph, or empathizes with a friend by picking a sorrowful cartoon character from a sticker store titled “Sad”? My distrust of our frantic memory making is further fueled by my reading this morning of a research paper from the Psychological Bulletin titled “Retrieval of Emotional Memories.” First, it is one of the ten commandments of contemporary neurology that “emotional events are often remembered with greater accuracy and vividness…than events lacking an emotional component.” In this article, Tony Buchanan reports—as our own experience with older people illustrates— that we (even those who have excellent memories) start forgetting from the present backwards. Hence the older we get, the more replete our stories become with memories laid down in childhood. In people like me with brain damage in the temporal lobe and a resulting loss of short-term memory, the process of forgetting the recent past is vastly sped up compared to my “normally-aging” peers. Ask me about that time I played hide-and-seek with the neighbors’ children in Goodwood, Cape Town, when I was four years old, but don’t ask me the name of a two-doors-away new neighbors’ child that I have asked to be reminded of multiple times during the past week. Our culture’s obsession with capturing each moment of our lives is making even people with intact brains into the equivalent of geriatrics with the beginnings of dementia. Despite my awareness of the futility to preserve memories when my brain is lurching toward the moment when I will no longer be able to access them, monkey does as monkey sees. Wasn’t I the one requesting that Peter snap a picture in the middle of an experience that I would probably remember better had I applied the psychic energy I had available to the pleasure of being fully inside the moment rather than on premature nostalgia? For whom, I ask myself, are the memories I strive to make with my grandchildren from week to week, month to month? Truth is, my memories already belong to them. I used to be an auxiliary nurse in a nursing home many many moons ago back in the UK and I never forgot the words of one dear sweet resident who said to me,” make memories because in the end that is all you will have left.” a cruel twist if one is losing their memory yet you gave yourself up to a wonderous joyful moment that has created memories for others and that is truly a gift. Your writing is amazing and this post made me smile so much. Thanks so much, dear Corinne, for your lovely comment. I love the additional glimpses into your life that I get: auxiliary nurse in a nursing home! I love it that i could make you smile, as your writing and art does every time I look.